Manchester City boss Roberto Mancini has said he wants Carlos Tevez "out of the club" after the striker refused to play against Bayern Munich. Mancini wanted to bring on substitute Tevez with 35 minutes left in an attempt to claw back a 2-0 deficit. But after the 27-year-old refused to play, Mancini said: "If I have my way he will be out. He's finished with me. "If we want to improve as a team Carlos can't play with us. With me, he is finished." The incident in the Champions League Group A match appeared to be sparked by the substitution of striker Edin Dzeko for midfielder Nigel de Jong 10 minutes into the second half. Dzeko showed his anger at the change, shaking his head at Mancini. "He [Dzeko] was disappointed but he played a bad game," said Mancini. "It is the last time any player at this club does that." Tevez, who was left on the bench throughout his side's Premier League win over Everton on Saturday, appeared unhappy he was not called on. And minutes later, when Mancini indicated to the Argentine to warm up, Tevez refused, sparking heated discussions on the bench. "He [Tevez] refuses to go in," Mancini said. "He refused to come on the pitch. What I said to Carlos is between me, him and the team [but] I am really disappointed because it is Carlos. I decide the changes. "It's a bad situation - it's important for a player to help the team. [The situation] is impossible. "I wanted to calm everything and put Carlos Tevez on the pitch. "I wanted to keep the score down and not concede a third goal." Mancini said a player at a top club could not "refuse to go in to help his team-mates". "Can you imagine a Bayern Munich, Milan or Man United player doing this?" he asked. "He refused to warm up and again refused to go on the pitch. If a player has a lot of money to play for Manchester City ... he can't [refuse to play], never. "I think tonight we had a problem, in this game. Before, we never had a problem, we started the season very well but I can't accept one player refusing to go in. "We will speak about this with the chairman in the next few days." The defeat was City's second Champions League tie after their draw with Napoli. Tevez spent pre-season searching in vain for a new club and earlier this month was permanently replaced as skipper by defender Vincent Kompany. The Argentine striker released a statement in July making clear his desire to leave the club for family reasons. A few weeks later, City thought they had agreed a deal with Corinthians for his sale only for the Sao Paulo-based outfit to pull out because they could not finalise the transfer before the close of their international transfer window. "He's [Mancini] had his fill. He's had enough. You cannot keep disrespecting the manager. Whether you like him or not, it doesn't make any difference. You're playing for yourself, your club, your team. There's quite a few managers I didn't get on with but you put your shift in, you play for pride because you're a professional. You simply cannot refuse to play in a football match. It's selfish, it's cowardly and bang out of order." Inter Milan were also consistently linked with the player, but instead opted for Atletico Madrid's Diego Forlan to replace Samuel Eto'o. 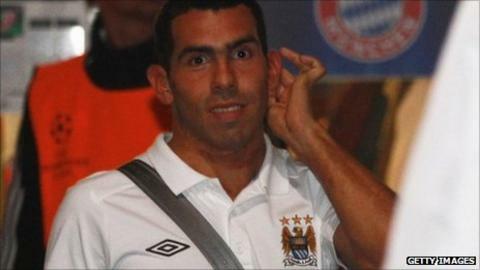 A combination of the fee wanted by City for Tevez and the player's salary demands seem to have warded off potential suitors. Late in August, Tevez admitted he had given up on moving before that window closed. In a brief interview with Sky Sports, Tevez, speaking through a translator, did not address his decision not to play. "I think it's Mancini's decision," Tevez said. "I've been a professional throughout. "I put my opinion through that I wanted to leave for family reasons and I still played my best." City coach David Platt said: "I don't think anyone can condone a player refusing to get warmed up, no matter what has gone on on the bench, no matter what arguments there might have been. But I think we have got to look at it internally and deal with it. "Right now it is very difficult for everybody. We need to calm down from the situation, at the same time as recognising that people want to talk about it."